The slopes of an active volcano in Hawaii are probably among the places you would least expect to find a vineyard, but you couldn’t be more wrong :D. The Volcano winery makes their own wine from locally grown grapes and is located just outside the Hawaii Volcanoes National Park. 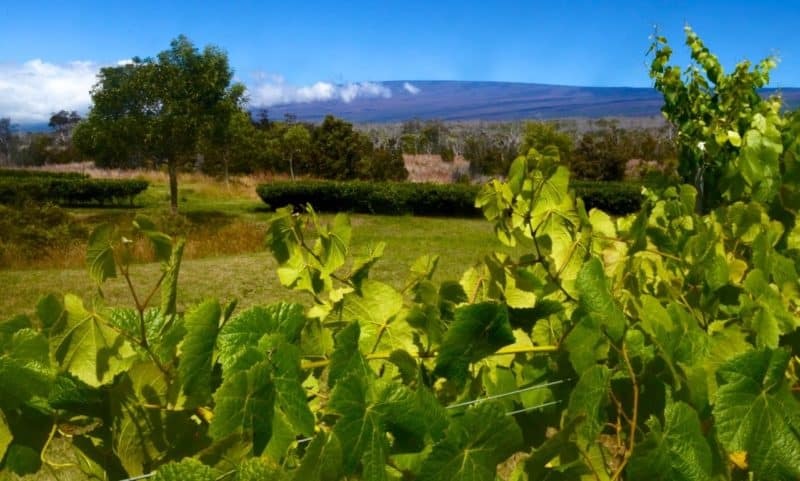 The vineyards and winery are located on the slopes of the Mauna Loa volcano, above Kilauea at an elevation of 400o ft. Volcanic soil, great views and fresh air make this a very special place to visit. In total the vineyard covers 12 acres on which they grow four different kind of grapes, and tow acres where they grow four different kinds of Japanese tea. The Volcano Winery is also the most southern winery in the United States, and, as such, specializes in creating tropical blends. This is a good place to pick up a tasty and unexpected souvenir for your loved ones at home. Local fruits such as guava are used to create unique blends such as Volcano Red, Volcano Blush, and Hawaiian Guava wine. The Volcano Winery also creates a lovely Mead wine which is made with 100% Macadamia honey. This wine is a sweet after-dinner treat that is uniquely Hawaiian. The Volcano Winery organizes tastings 364 days of the year (closed on Christmas day) between 10:00 and 17:30 and no appointment is necessary. Their wines are only available in physical stores on the Hawaiian Islands and country-wide through the online store. The tastings are available at “standard” ($5) or “premium” ($8) level, and the difference between the two is the different kinds of wine you can taste. Premium most notably gives you a shot at tasting their most expensive wine: the tea infusion blend. You can read more about their tasting menu here. The Volcano Winery is located about 3 miles south of Volcano Village, off of Highway 11 between the 30 and 31-mile marker. Turn north on Pi’i Mauna drive. Follow Pi’i drive all the way to the end of the road and you will see the entrance to Volcano Winery. The winery is a little less than a mile down the road. Visit the website of the Volcano Winery here.